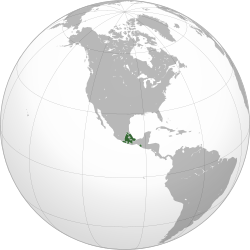 The Aztec Empire was a large empire in Central America. It existed between about 1345 AD and 1521 AD. When the Empire was largest, it spread across most of Mesoamerica. During that time, the Aztecs built one of the world's most advanced societies. The Aztec Empire was also very powerful. Its warriors took over many nearby states and helped spread Aztec culture and religion across Mesoamerica. However, in 1519, Spanish conquistadors came to the Aztec Empire. With help from the Aztecs' enemies, the Spanish fought the Aztecs for control of their empire. On August 13, 1521, the Aztec Empire fell apart and the Spanish took over. They made the area a Spanish colony and renamed it New Spain. Before the Aztec Empire existed, the indigenous (native) people in central Mesoamerica lived in many separate city-states. These were small cities with farmland around them. Each state had its own ruler. Around 1100 AD, these city-states started to fight each other for power and control of the area's land. By about 1400, two city-states had grown into small empires. In 1428, these two empires fought the Tepanec War for control of the area. The Texcoco empire made an alliance with some other powerful city-states, including Tenochtitlan, and won the war. These allies were supposed to share power equally as they started to gain control of more land. However, by 1430, Tenochtitlan became the most powerful member of the alliance. It became the capital city of the Aztec Empire, and its ruler became the 'high king' of the entire Empire. When the Aztecs took over a state, they would take prisoners for ritual human sacrifice in Tenochtitlan. The state would also have to pay the Aztec Empire "tributes" (almost like taxes). As the Aztecs took over more and more states, these tributes made them very rich. Sometimes, when the Aztecs took over a state, they would bring that state and its people into the Aztec Empire. However, if a state was on the edge of the Empire, the Aztecs might let it stay its own state. They did this so they would have other states around the Empire, protecting them from an invasion by other powerful states. The Aztecs had built their capital city right on a lake called Lake Texcoco. As the Empire grew, so did Tenochtitlan. By the early 1500s, at least 200,000 people lived in the city. This made Tenochtitlan the largest city in the Americas before Christopher Columbus arrived. Tenochtitlan was the center of the Aztec government and religion. It was also a very big trading center. When the Spanish arrived in 1519, they guessed that 60,000 people came to the market in Tenochtitlan every day. People bought and sold many things there, including slaves (prisoners of war from states the Aztecs had taken over). The city had a huge pyramid called the Templo Mayor (Great Temple). The entire city was decorated with art, architecture, and stone sculptures. The Aztecs had created canals all across the city. By bringing water to Aztec crops, these canals made it possible for the Aztecs to grow much more food than they normally could have. The Aztecs had also made levees to protect the city from flooding, and reservoirs for fresh water. At its most powerful, the Aztec Empire controlled about 11,000,000 people. Among these people, there were different social classes with different social statuses. The most important people were the rulers. Next were nobles. These were the Empire's powerful members of the government; great warriors; judges; and priests. These people enjoyed a high social status. The next social class was the commoners (common people). These were the Empire's everyday workers. Most of them farmed, ran stores, or traded. Commoners were allowed to own land as a group or a family. However, a single person was not allowed to own land. The lowest social classes in Aztec society were serfs and then slaves. Slaves had no rights at all. However, if they had the money, they could buy their own freedom and become commoners. By age 15, all children in the Aztec Empire had to go to school, no matter what social class they were in. This was very unusual for the time. In other places, like Europe, only boys were allowed to go to school, and only rich people could pay to send their children to school. Until they were 15, children were taught by their parents. Once they turned 15, all children had to go to school. For most boys, the most important part of going to school was to make them the best possible warriors for the Empire. “ Question: What [do] we enter in three places [and] leave by only one? Children of commoners went to schools called telpochcalli ('youth houses'). Boys got military training, while girls were taught how to do religious ceremonies. Both boys and girls were also taught about Aztec religion, morals, and history. They also learned singing, dancing, and public speaking. The nobles' children went to a school called a calmecac. Its goal was to get the children ready for jobs as the Empire's leaders. These included jobs as military or government leaders; priests; scholars; teachers; and healers. These schools taught about things like astronomy, geometry, mathematics, debate, law, music, poetry, architecture, agriculture, and war. Boys had to eat and sleep at their schools. They usually started at age 15 and left around age 20 to get married. Girls could become priestesses or work in medicine, helping other women give birth. When a young person was ready to get married, their education would end. This usually happened in their late teenage years or early twenties. Especially with nobles, marriages were arranged. This meant children's parents, or possibly other older people in the community, would choose who a person married. Many marriages among noble youth were arranged as a power strategy (for example, to unite an Aztec with a family from a state that was recently taken over). Marriage ceremonies lasted four days. Aztec men were allowed to have other wives as well as concubines. However, they were also expected to raise their sons, which was unusual for ancient societies (where women usually did all of the child-raising). Aztec society also gave women rights that few other societies gave at the time. Even after marrying, an Aztec woman's property and money were still her own; they did not go to her husband. Women were also allowed to work in medicine, education, religion, and trade. The Aztecs had strict rules and punishments for people who broke Aztec morals. For example, things like disorderly conduct (causing trouble in public), drunkenness, could be punished by execution. At this time, most battles were fought in big cities. If an army took over one of a state's biggest cities, it was then allowed to take control over all the land around those cities. Aztec warriors protected themselves with thick cotton armour. They also had shields made of wood or reeds, and covered in dried animal skins. The Aztecs were pantheistic, meaning they believed in many different gods. Two of the most important gods they worshipped were Huitzilopochtli, the god of war and the sun, and Tlaloc, the rain god. The Aztecs set up temples specifically to honor these gods at the top of the pyramid in Technochtitlan. However, they also worshipped hundreds of other gods. Each one controlled some part of human life (like Quetzalcoatl, the god of learning and civilization), or some part of nature (like Zipe Totec, the god of springtime and regrowth). In the Aztecs' religion, the sun was very important. The Aztecs believed that the world went through five stages, and each had its own sun. At the end of each stage, the gods would destroy the world and create a new one – but only four times. They thought they were living in the fifth and last stage, and that the gods could decide to destroy the world at any minute. The Aztecs did many things to try to honor the gods and keep them happy. For example, they threw festivals, had banquets, made statues, and buried valuable items, all as offerings to the gods. They did penance, like cutting themselves and letting blood run out, to try to get the gods to forgive them for whatever they might have done wrong. They did ritual sacrifice of animals (killing the animals as part of a religious ritual). However, there were many parts to the Aztec culture. They studied astrology and used the movements of the planets and the stars to create different calendars. They understood and taught things like mathematics and poetry. They had a complex view of religion, the universe, and many other things. Aztec culture respected and appreciated art. They collected pieces of art from all over their Empire to decorate Tenochtitlan. They also formed guilds of artisans – people who specialized in making certain kinds of art. They made paintings, pottery, carvings, and many other things. They used all sorts of materials, including gold, silver, amethyst, wood, and stone. Huge stone sculptures were a popular type of art. Aztec artists made their pyramid and other stone buildings into art too, by carving into them. The Aztecs used symbolism in their art. They even used art as propaganda. For example, when they took over a state, they would build temples and statues with Aztec symbols on them. They also used paintings that showed Aztec rulers as being close to the gods, doing what the gods wanted them to do. This art spread Aztec religion and culture, and also reminded states that had been taken over just how powerful the Aztec Empire was. From 1519-1521, Spanish conquistadors, led by Hernán Cortés, defeated the Aztec Empire. They made the Empire into a Spanish colony which they called New Spain. Originally, things between the Spanish and the Aztecs were friendly. However, soon, while Cortés was away, Spanish soldiers attacked and killed many Aztecs during a festival. The Aztecs fought back, and they killed two out of every three Spanish soldiers. The conquistadors left Tenochtitlan. Ten months later, Cortés came back to Tenochtitlan with more soldiers. They started a siege of Tenochtitlan, so that no food or supplies could get in. After 91 days, without any food, and with disease throughout the city, the new emperor Cuauhtemoc finally surrendered to the Spanish on August 13, 1521. The Spanish destroyed Tenochtitlan. The Aztec Empire had ended. ↑ According to Aztec codices: Figure A means Atoctli (sediment by water); Figure B means Tlacotli (expensive); Figure C means Ixpouhqui (withered); Figure D means Xalteyo (sandy); Figure E means Tlacemolotlalli (inherited land); Figure F means Petlauhtl (uncovered); Figure G means Ocotla (pine wood); Figure H means Zacatl (grass) and Figure I means Teuhtli (dust). ↑ This painting was probably done in the 16th century by a Mexican Jesuit named Juan de Tovar. It is from a famous book he wrote about the Aztecs that historians call the Tovar Codex. ↑ Historian William Marder says: "Human and animal sacrifices were practiced throughout the world ... for example[, by] the Irish Celts, the Gauls, the Scandinavians, the Egyptians, the Phoenicians, the Moabites, the Ammonites ... the Israelites ... [in] the Mesoamerican societies of the Aztecs, the Mayans and Olmec ... [and in] that same era, the Assyrians." ↑ 3.0 3.1 "Country Comparison: Area". The CIA World Factbook. United States Central Intelligence Agency. 2016. Retrieved April 17, 2016. ↑ "State Area Measurements and Internal Point Coordinates". United States Census Bureau. December 5, 2012. Retrieved April 17, 2016. ↑ 6.0 6.1 van Teurenhout, Dirk R. (2005). The Aztecs: New Perspectives. ABC-CLIO. p. 157. ISBN 978-1576079218. ↑ 8.0 8.1 8.2 8.3 "Central and South American Empires: 11d. The Aztec World". Ancient Civilizations Online Textbook. The Independence Hall Association. 2014. Retrieved April 17, 2016. ↑ 9.0 9.1 9.2 9.3 9.4 Cartwright, Mark (November 23, 2015). "Aztec Society". Ancient History Encyclopedia. Ancient History Encyclopedia Limited. Retrieved April 17, 2016. ↑ 10.0 10.1 10.2 10.3 "Aztec Indians". Tribal Directory. Retrieved April 17, 2016. ↑ 12.0 12.1 12.2 12.3 Brodd, Jeffrey (2009). World Religions: A Voyage of Discovery. Saint Mary’s Press. p. 32-36. ISBN 978-0884899976. ↑ 15.0 15.1 Aguilar-Moreno, Manuel (2007). Handbook to Life in the Aztec World. Oxford University Press. p. 352-353. ISBN 978-0195330830. ↑ Lockhart, James (1992). The Nahuas after the conquest: a social and cultural history of the Indians of central Mexico, sixteenth through eighteenth centuries. Stanford University Press. p. 578. ISBN 978-0-8047-2317-6. ↑ 17.0 17.1 17.2 17.3 17.4 17.5 17.6 Cartwright, Mark (February 26, 2014). "Aztec Civilization". Ancient History Encyclopedia. Ancient History Encyclopedia Limited. Retrieved April 17, 2016. ↑ 22.0 22.1 22.2 Somervill, Barbara A. (2009). Empire of the Aztecs. Infobase Publishing. p. 63-69. ISBN 978-1-604-13149-9.